To me, it’s a great slogan because people who make progress every day are the active and busy people of this world. And whether they are raising kids, taking on new challenges at work/home or running a business, they’re the same kind of people who appreciate smartphones, high speed Internet and other advanced communications services. “Progress people“ also fit the profile of high value, upwardly-mobile customers who can afford advanced communications services, so almost every CSP wants to attract them. OK, let’s play a little game of make-believe and see how well our current sales-order processes and systems would handle the ideal customer’s quest to acquire a new smartphone. In this case, Verizon’s ideal customer is Jane, a 30ish working mom who’s a lawyer by trade with a couple kids in grade school. In between the tough case load she’s got this week, Jane’s got a few things on her mind today such as ordering a new smartphone, picking up a carton of milk on her way home and meeting her son’s teacher at the school tonight. Now as a CSP, the smartphone sales channels you’ve put in place — call center, website, retail store, etc. — all need to respond to Jane’s needs. And it’s quite likely Jane won’t complete that smartphone sale through one channel alone because it’s a complex decision, and in today’s busy world, the customer decides the mix and sequence of sales/ordering channels. That often means several “sales conversations“ need to occur before the order is closed. At lunchtime, Jane does a little research on smartphones by visiting your website where she actually starts her order. Jane likes what she sees and narrows down her choices to five smartphone models. To get a better idea of the strengths of each phone, she speaks to a live agent at your call center. On her way home from work, Jane is feeling ready to buy, so she drops by one of your retail stores to try out some of the handsets. Finally, when she arrives home after placing her order for a smartphone, she realizes she ordered the wrong data plan and wants to have that updated before the handset is shipped. At the same time, Jane orders an accessory for the phone. OK, the ordering scenario just described is a highly complex one that transverses multiple sales channels in a matter of a few hours. While Jane does “make progress“ and eventually buys a smartphone, the ordering process is a convoluted, multi-step one requiring her to repeat steps and provide the same information at each channel. Is your Sales Process Seamless? So here’s the question: How well would your ordering process handle such an order? Would your process execute the transactions seamlessly, allowing an efficient and accurate handoff of information from one sales channel to the next? Probably not. At most CSPs, these processes would be highly disconnected. Frankly, CSPs have a long way to go to deliver true cross-channel ordering. In wireless, for example, there’s very little capability today to start an order online and complete it at a store. But that’s exactly the experience consumers are looking for. So how are you, as a CSP product manager, going to orchestrate this incredibly complex customer-ordering experience? 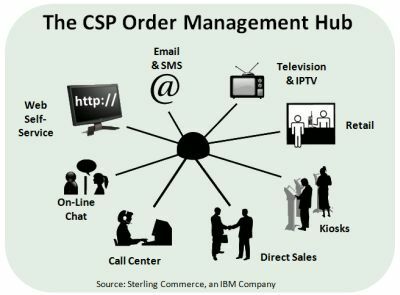 At Sterling Commerce, we feel the answer is to insert a cross-channel ordering hub in the middle of all these transactions. A cross-channel hub basically sits above all of the sales channels (or touch points), interacts with them all and allows a CSP to keep the sales conversation moving forward. The hub manages the order no matter where it originates, who touched it, and who finally completes it. The diagram below illustrates the many sales channels the hub gets inputs from: kiosk, the Web, call center, direct mail, television/IPTV and the many retail partners and third-party agents who are often involved. And given the many nuances in sales channel systems and processes, building a cross-channel ordering hub won’t be easy or cheap to build. Yet attracting and retaining busy, communications-savvy customers like Jane is certainly a worthwhile goal. For customers who have already implemented a system like this, the benefits of cross-channel orchestration are far-reaching. Intelligence about a customer’s needs extracted from one channel can actually drive real-time offers in other channels where the customer roams to next. Customer service is also greatly enhanced. For example, if a customer recently complained to the call center about service and the customer arrives at a retail store to disconnect service, cross-channel intelligence about the problem can enable the retail store agent to respond, “I’m truly sorry about the problem you had with our service this month. What I can do for you is this: give you a special discount of one month’s free service for your trouble.“ Action like that could very well save a good customer. OK, the next question you’re probably asking is: What’s it actually take to put a cross-channel ordering hub in place? Well, that’s the subject of my next blog.